2. 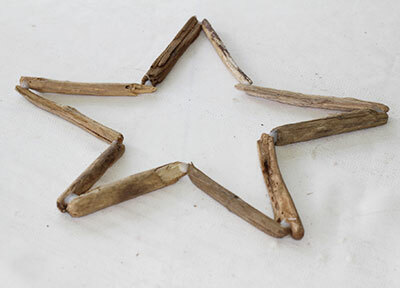 Once you have your driftwood star figure, then just glue the ends. I discovered the hard way that it is much easier to fill them with the crushed candy if they are as level as possible and as many sides as possible rest on the parchment paper so that the melted candy has something to adhere to. 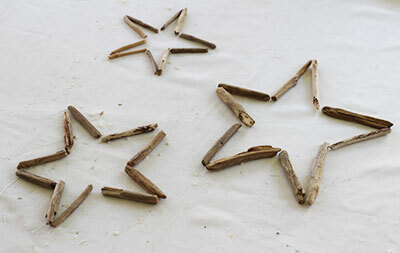 Try to glue the points together without resting the driftwood pieces one on top of the other in order to adhere the points. If you are using the Stienel Glue Gun and Adhesives, you will find that the glue will become opaque so a little will go a long way. This is a strong glue but it has its disadvantages. It will hold together better than regular glue guns and the glue is both waterproof and heat proof so it does work well in Florida’s heat. It even held up fine while in the oven when the candy was melting. However, half way through my project, the gun’s heating element broke and I had to resort to another method to finish my stars. I chose to go with E6000 glue which you can find at any hardware or craft store. E6000 is very good and also held up in the oven. It dries clear, but it does not dry quickly so it was time consuming to hold together ends until they were dry enough. Glue the eyelet screw in place so you can attach a ribbon for hanging. Now you will need to crush your candy. 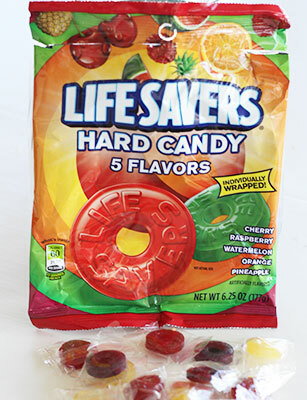 Use hard candy such as Lifesavers or any hard candy that, when melted will give you that stained glass look. Menthol hard candies should give you that pretty holiday blue color. Sour apple or watermelon hard candies will work. I buy a large bag of candies and unwrap each individual piece then double bag them in ziplock baggies and pound away with a hammer until you have the smallest bits possible. A fine powder is best because it will melt quicker and result in a smoother more glass like appearance. 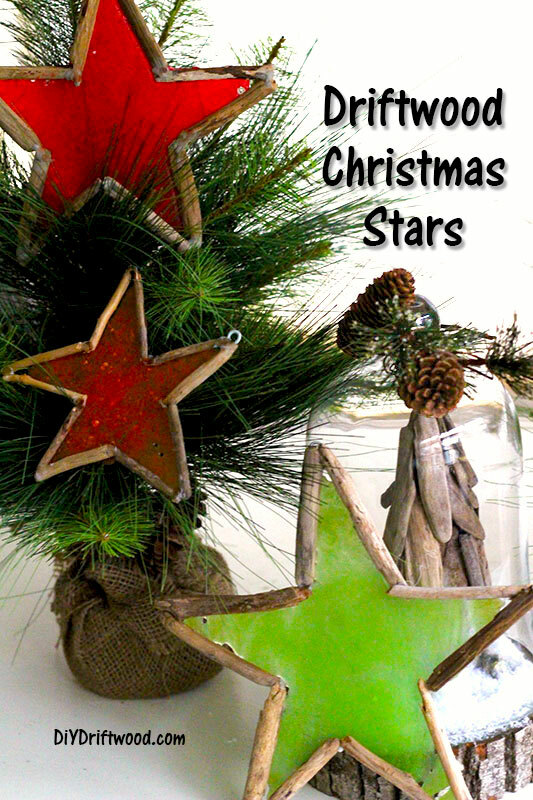 Set your driftwood star on some parchment paper or tinfoil and place on a cookie sheet. 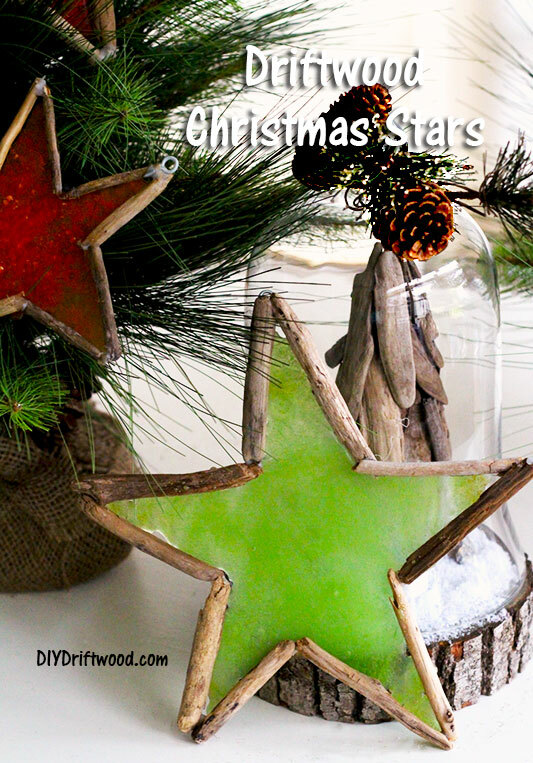 Then fill in the driftwood form with your crushed candy. The more candy you use and the thicker it is, the longer it will take to melt. Also, the larger your crushed pieces are – the longer it will take to melt. 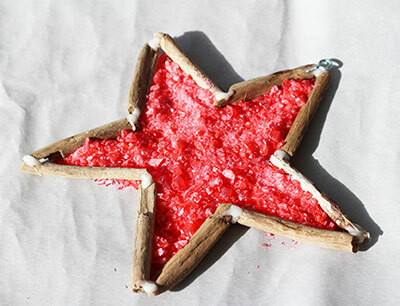 The above star was filled to about 1/4″ with crushed candy and took longer to melt in the oven. It was about 8 minutes at 200 degrees. 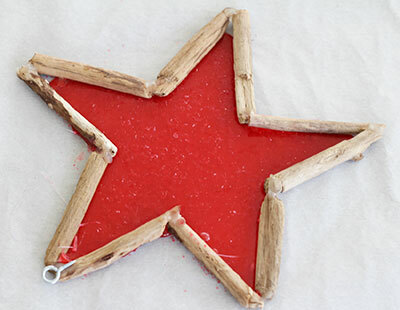 My other stars were not as thick and I put the oven at 250 degrees and they melted in about 4 minutes. You need to keep an eye on them so they don’t burn so I would start at 200 degrees and do 4 minutes and then check it every 2 minutes. Once it has melted, take it out of the oven and let it cool before moving it around as the candy is fragile and will crack especially if it is thin. After it is cooled, you can spray it with a polyurethane to help keep it from attracting bugs and also from melting if it becomes too warm. 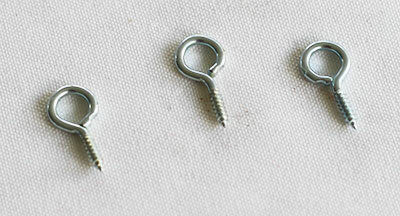 Then tie a ribbon through the eyelet screw and use them to decorate.